The FBI’s former general counsel acknowledged a series of “abnormal” and “unusual” steps that were taken during the early days of the bureau’s investigation into possible Trump campaign collusion with Russia. James Baker told lawmakers in 2018 that during the 2016 campaign, a DNC lawyer provided him with information alleging a Russian bank had a back-channel communication system with Trump entities. Baker also said he reviewed an application for a surveillance warrant against Trump aide Carter Page, even though he rarely, if ever, handled warrant applications in other cases. James Baker, the FBI’s former top lawyer, told Congress in 2018 about a series of “unusual” and “abnormal” steps he took in the early days of the bureau’s investigation into possible collusion between the Trump campaign and Russian government. Baker told lawmakers during testimony Oct. 4 and Oct. 18, 2018, that even though he rarely handled applications for surveillance warrants against American citizens, he reviewed one the FBI was seeking against Carter Page, the former Trump campaign adviser. Baker, who resigned from the FBI in May 2018, also said he had a meeting Sept. 19, 2016, with a lawyer working for the DNC. The meeting was unprecedented for Baker, who told lawmakers he could not recall ever having met with an outside counsel during his FBI tenure. 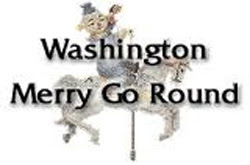 The Washington Merry-Go-Round pays tribute to the controversial themes of Drew Pearson and Jack Anderson, adding the significance of commentary to the relationship of raw political power and financial influence. © 2000-2019 by BATR All Rights Reserved. Picture Window theme. Powered by Blogger.